I just got my hands on a review copy of Eek! Said Amy by L.J. Zimmerman. It’s a short read, ideal for bedtime with the children. The illustrations are catchy and will make you laugh at times. The story is about learning to handle emotions. Right from the start it reminded me of the Disney movie “Inside Out” with a major differences. In short, Eek! Said Amy points children (and parents) back to God to help deal with emotional struggles. Our feelings are normal – even things like fear and anger. With God’s help we can all learn to manage those urges. Meet Devon. 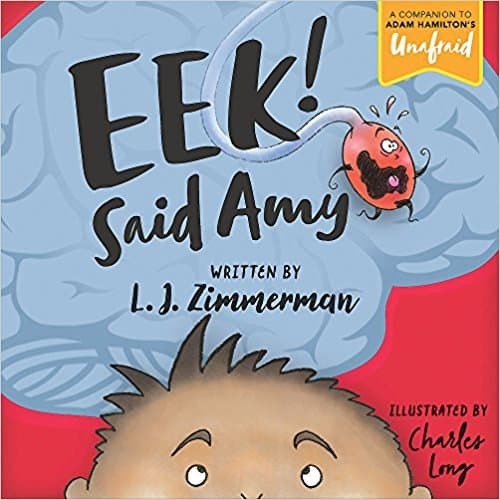 Devon is a little boy that introduces readers to his friend Amy the AMYgdala! Amy helps Devon feel emotions, including fear. Through his friendship with Amy, Devon learns that fear helps him stay safe, but sometimes he needs to face his fears. An age-appropriate book to teach kids how to deal with fear. Recommended for ages 3-7. Check out the book on Amazon – it’s coming out in March 2018. Tony Kummer (Editor) reviewed & updated this page on : March 15, 2018 at 11:55 am. All our content is peer reviewed by our readers, simply leave a comment on any post suggest an update.